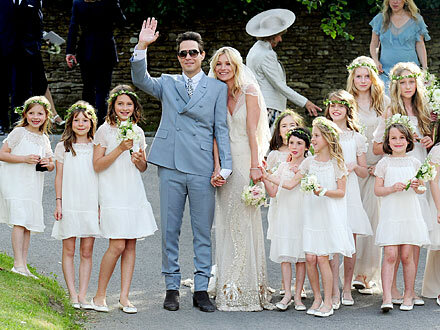 Supermodel Kate Moss married Jamie Hince in Southrop Village, England Friday (July 1). Kate's 8-year-old daughter, Lila Grace, was a bridesmaid at her mom's wedding, which included a total of 12 bridesmaids! The bride looked gorgeous in a cream, vintage-style dress with rhinestone detail, reportedly by John Galliano, and the groom wore a light blue Yves Saint Laurent suit, striped shirt and patterned tie. Police monitored roads surrounding the model's home, which was barricaded for the festivities. Celebrations will continue there over the weekend, for a days-long party dubbed by the media as "Mosstock." "I definitely want kids. I'm forty f**king two, I'm getting on."